Schedule; Results; Medals; BBC coverage; Day-by-day guide; Are GB&apos;s skeleton suits giving them superhero speed? We are parking up the live text, but you can stay watching the highlights, and we'll be back tonight. Highlights of day six include Dom Parsons in the skeleton and the women's giant slalom. It is amazing! I have been in four Olympic Games and I have never seen doubles luge. She also suggests jumping on a luge with Chemmy Alcott. Steady on Rhona! Miss Harding: I'm still sick so still finding sweet comfort in BBC Olympics. Just discovered Double Luge. Oh My God. Completely inexplicable. It's only taken them 38 seconds of overtime to record victory. What a brilliant comeback! They have beaten USA in overtime. A first ever victory for Slovenia in international hockey against the United States. Slovakia have come from 2-0 down to win it. Jan Mursak wins it. Angela Garrod: As if Luge wasn't mad enough, I am watching double luge. Why, just why?! Thelma Holland: Loving watching the 'double decker' luge. Ellie: Double luge - what madness is this? We would love to be able to answer your questions, but we can't. Sorry. And that's how normal time finishes! A late equaliser for Slovenia gives them the draw. We go to overtime. In the night's other game, Slovakia beat OAR 3-2. The special play comes off for Slovenia! They have equalised. It's the captain, the leader, who draws them level. They had the extra skater and it paid off. Bradley Hill: And the best fashion award goes to Norway Men's Curling Team. They never fail to impress. American snowboarder Shaun White becomes halfpipe Olympic champion for the third time with a score of 95.75 in his final run, narrowly beating Japan's Ayumu Hirano. History is made as Randi Heesoo Griffin scores unified Korea's first Olympic hockey goal against Japan in the group stages at Pyeongchang 2018. 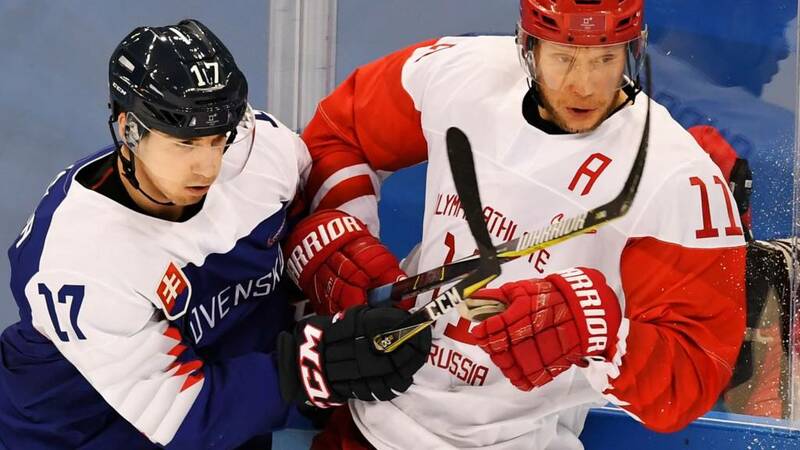 There are two ice hockey matches under way but that's it for live sport for the day. Great Britan really put pressure on Canada in the second half and it could have been a different result. They will look at the analysis. The coach will look at it and they will try and work out what they could have done differently. The Canadian team just didn't look as enthusiastic as normal Canadian teams are but there is a lot of pressure on them. They are expecting to win the gold. They are a strong team and they are steady. They communicate very well. They talk out each shot. Anthony Shaw: GB can't pull it off! :( I'm utterly exhausted after watching the curling. Superb! Robert T Bruce: Bad luck team GB, you did your best. Team GB men's curling skip Kyle Smith speaking to BBC TV: "It was a shame because we had quite a slow start. We played a lot of good curling once we got into it. It's a pity we didn't start with that form. "It's good to get the first win under our belt this morning. We played two very difficult games but there's a lot to take from tonight's game so we will take that into tomorrow." Thomas Muirhead: It's [Canada] a team you have to go out and play your best against. Hopefully we can carry on the second-half form tomorrow. We will come back fighting. Carry Smith: I seemed to struggle a wee bit with some of my play so I'm hoping it was the stones. GB have seven more games in the round robin so have plenty of time to make that crucial top four. Great Britain were unable to make the steal. They played pretty well but it was a tricky start to the match. I'm going to say no. Canada flick away the GB stone and leave one in the house. Here's the last shot from GB coming up. Team GB have one stone left. Can they force a draw?